Skyhigh Kiteboarding is Martha's Vineyard's premier Kiteboarding school and a world renowned kiteboarding destination experience! Frequent and consistent wind from every direction is what makes Martha's Vineyard kitable over 200+ days of the year. We operate every windy day May through October and are on standby ready to go when the wind's up! Even the best locations in the world are subject to mother nature, but we are blessed with the most frequent wind in New England! We travel by boat to find world-class kiting locations perfect for beginners or the seasoned pro seeking an unforgettable kiting experience. 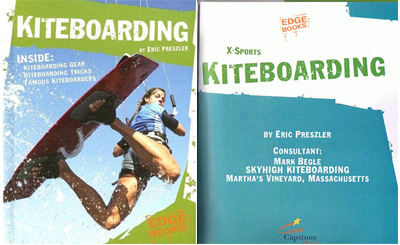 Founder, Mark Begle, is a Master Licensed Captain and a Certified Professional Kiteboarding Instructor. He has successfully taught over 2,500 students since 2001 as one of the Nation's first kiteboarding instructors and has been a contributing author to articles and a children's book about the sport. Mark brings a lifetime of waterman experience which promotes a confident learning environment for his students. Our kiteboarding instructional programs have been custom-designed to maximize your learning curve, fun, and safety. Our unique instructional methods have continued to evolve with the advancements in kiteboarding gear and instructional techniques. Skyhigh Kiteboarding has a proven record of success and is unmatched in student advancement. We operate aboard our custom Ribcraft Kiteboat. When you enroll in any of our lessons & tours you are also embarking on a boat charter. We seek out the best conditions only accessible by boat and carry a full quiver of the latest gear onboard. If the wind picks up or drops we can easily switch a kite or board to keep you riding. We launch & land kites directly off the boat saving time and promoting safety. You practice in real time conditions, not just in the confines of shallow water. Learn to stay upwind while practicing downwinders, while the boat brings you back upwind with your kite in the air saving valuable time during your lessons. This is our difference! We make you learn what it takes to be a kiteboarder in real conditions! "Featured in the Sunday Travel section of the Boston Globe, MV Times, Plum TV, & The Kiteboarder Magazine"
The Boston Globe, MV Times, & Plum TV have featured Skyhigh Kiteboarding as the best place to learn the sport of kiteboarding/kitesurfing in New England! 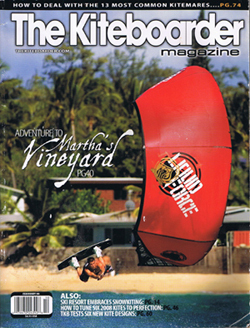 Skyhigh Kiteboarding Inc. has been involved in the sport of kiting for over 17 years. We have safely taught over 2,500 students on Martha's Vineyard since 2001. Come discover our kiting locations and experience the epic conditions of our region. Martha's Vineyard is a world-class kiteboarding destination!